Optical discs like Blu-ray are losing favor, but Sony and Panasonic don't seem to care. The companies have cranked up the storage capacity on optical media to a stunning 3.3TB. That's a big advance in Sony's optical storage, which is based on technology used in Blu-ray. The 3.3TB disc is targeted at studios, filmmakers, and broadcasters that store large volumes of video, and at large companies that store infrequently modified data. For example, video streaming companies could hold a large library of films in storage arrays with many optical drives. Instead of using PCs, servers in data centers could then pull out movies from the drives and serve them to users via the cloud. The jump to 3.3TB is also a big jump from older optical media. The first CDs came out in 1982 with a capacity of 650MB, and DVDs came out in 1996 with a capacity of 4.7GB. Today's Blu-ray media can store up to 100GB of data, and earlier this year, Sony and Panasonic said they will ship 300GB media for optical archival systems in data centers. Optical storage is keeping up with SSDs and hard drives in the race to cram more storage into drives and media. But unlike magnetic drives or NAND flash, optical storage isn't designed for regular reads and writes, limiting its use. However, support remains for this form of optical storage because of reliability. Sony says the media will have a 100-year shelf life, longer than other storage technology. It remains to be seen whether the new development would translate to an advance in capacity for Blu-ray discs. The current capacity is considered adequate for 4K films. 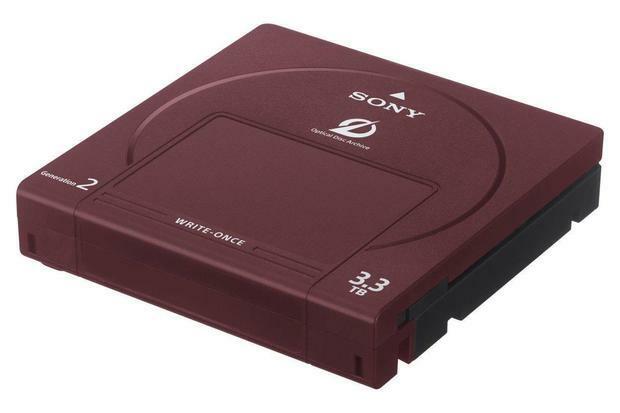 The 3.3TB media is part of Sony's second-generation Optical Disc Archive System, a successor to the original system launched in 2013. Sony also announced optical drives to support the new media. The new drives are faster than predecessors and generic Blu-ray drives, which have notoriously slow read and write times. The optical drives will be available in the form of a USB drive unit that can plug into a computer's USB port, a fiber-channel library drive unit for storage systems, and Optical Disc Archive Cartridge for data centers. The drives will ship in the summer, Sony said. The new media will work with Everspan, Sony's robotic storage system that can store up to 181 petabytes of data. Sony is offering Everspan as an alternative to tape or hard-drive storage in data centers. Sony is encouraging companies to support the Optical Disc Archive System, which is being pitched as a new system to store archived data. Sony said 42 companies have created interfaces for the storage technology. The 3.3TB media and drives were announced at NAB Show in Las Vegas, where Sony is also previewing several 4K video-related products.